What's bothering my cat's eyes? Your cat’s eye(s) can become inflamed for a variety of reasons, ranging from conditions that are easy to fix to some that are very serious. There are many lesser common eye conditions that can cause eye inflammation. Your veterinarian will work to identify what is troubling your teary-eyed friend. 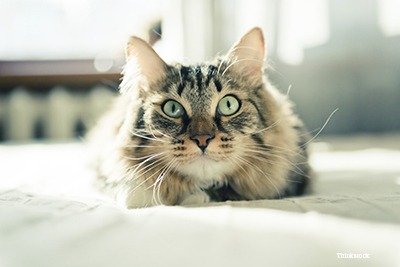 The most common sign that your cat’s eyes are irritated is redness. Additionally, he may blink or squint excessively, hold his eye closed, rub or paw at his eye, and his eye might tear a lot. There may also be some mucus or pus-like discharge around your cat’s eye(s). If you think your pet’s eyes are irritated, you should contact your veterinarian for advice. Many of the most common situations need medical attention in order to get better. Your veterinarian will most likely perform a complete ophthalmic examination to determine the cause of the inflammation. In more serious situations, they may send you to a cat eye expert, also referred to as a veterinary ophthalmologist. Your veterinarian will advise you regarding the best way to care for your pet’s eye(s). One of the most common treatments is to apply medicated drops or ointment to the affected eye. Having your feline compadre sit still while you apply the medication can be extremely challenging. For help with this, watch an expert apply eye drops to a cat. Because there are so many different causes of eye inflammation, there is no single prevention that works for every situation. To help your cat reduce the risk of eye problems, check his eyes daily for any obvious signs of irritation, such as redness or tearing.